Rilee Rossouw hit a blistering 90 but a late collapse saw Hampshire struggle to a four-wicket win chasing a Duckworth-Lewis Stern target of 227 against Surrey. By the time he was dismissed, bowled backing away to Rikki Clarke trying to hit into-out over cover, the target was down to just 60. But a flurry of wickets for Clarke — who finished with 4-48 — kept Surrey in the match. After removing Rossouw, Clarke got Brad Taylor with a leading edge to midwicket and then Gareth Berg, bowled by a slower ball. It took a steady hand from Joe Weatherley, who ended unbeaten on 46, to see Hampshire over the line with seven balls to spare. Lewis McManus was dropped by Sam Curran on just two in Clarke’s final over with 30 runs needed, and with it the steam seemed to go out of Surrey’s attack. McManus compounded the misery by hitting four and then six off Curran’s penultimate over to take the game away. Rossouw has come in for some criticism for his Specsavers County Championship performances — which include just two half-centuries, in his second game last season and his most recent game this year. But he seems to thrive in white-ball cricket where he has both the license and the field settings to pummel bowlers. Here, he did just that. If Dean Elgar’s run-a-ball 91 for Surrey earlier in the day had been unfussy and calm, this was proof of cricket as entertainment. There was nowhere Surrey could bowl to him where he wouldn’t be hit. More importantly, there was no gap in the field he couldn’t find. In the first over, on zero, Rossouw tried flicking down the legside and Ben Foakes dropped the ball. Replays were inconclusive as to whether he’d hit the ball but if it was a life, he certainly made the most of it. He went about his business in ambitious style, crashing the ball square both sides of the wicket. Shortly after opening partner Hashim Amla was dismissed, Rossouw flicked the ball for six over fine leg before repeating the feat with an audacious pull off Clarke, advancing down the wicket, in the following over. His 34-ball half-century was a real blink-and-you’ll-miss-it innings, the ball unstoppable if it was even a fraction wide of the fielder, such was the power off the bat. This was like a restrained range-hitting session, and it made for glorious viewing. Amla looked every bit the international batsman he is for his 28, playing some elegant drives before being harshly adjudged lbw to Clarke, hit outside the line of offstump. James Vince made 14 but fell in similar fashion as Rossouw, to Gareth Batty. Earlier, Elgar had shown only a couple of rare moments of aggression in his third half-century for Surrey, charging at off-spinner Brad Taylor and whipping him over midwicket, first for six and then later for four. As those around him unleashed reverse sweeps and reverse paddle scoops — a clever adjustment by Clarke — Elgar was intent on sticking around. His half-century also came at a run-a-ball. 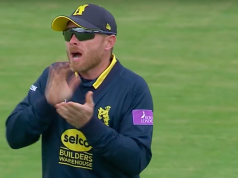 But as he approached what would have been his maiden Surrey century — in any format — he tried to run Gareth Berg to third man and instead chopped on, swinging his bat angrily immediately afterwards. Rain delayed play for over an hour just one ball after Elgar’s dismissal, after which Scott Borthwick, deployed at number seven in a curious selection choice, let loose to help Surrey above 250. He swatted Fidel Edwards for six over square leg on his way to an unbeaten 46 as Surrey finished their reduced 44 overs on 262-7. Will Jacks proved why he’s rated so highly by England’s youth set-up with an assured 28 that got his side off to a strong start. He drove beautifully to the boundary, but then Jimmy Adams, one-handed, plucked a cover drive out of the air diving to his right to dismiss Jacks. 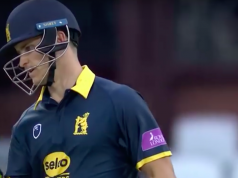 Mason Crane, playing just his second match after recovering from a stress fracture to his lower back, picked up three wickets in the space of four overs to put Hampshire in command. His figures of 3-45 in eight overs were about right, with some often erratic deliveries in amongst the odd wicket-taking one. 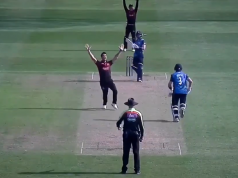 He removed Rory Burns lbw — the Surrey captain attempting his second reverse sweep in as many Crane overs, the first of which went to the boundary — and then Ollie Pope in the same manner while sweeping. Crane then bowled a peach, deceiving Ben Foakes in the flight and spinning away just enough to beat the bat. The wicketkeeper had advanced, and couldn’t make it back before Lewis McManus stumped him.